I love a good regional word or saying. Where I’m from you can ‘have a cob on’, ‘be a mardarse’ or ‘firkle around’. I’ve also always like to get my boots ‘plothered’ but no-one else has heard of this so I suspect I might have made it up. So, I like the fact that this week’s cheese, Norfolk Mardler, is named after a dialect word. Ah, c’mon, everyone knows what a mardler is, right? 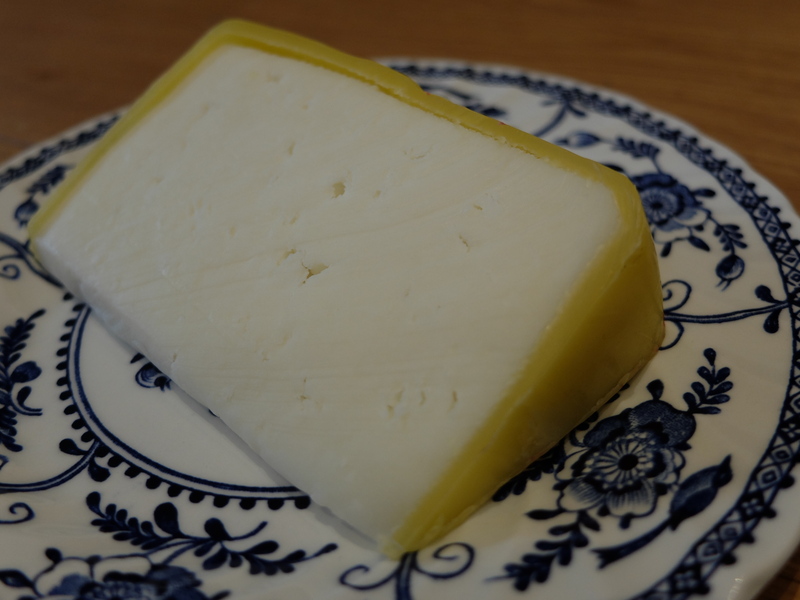 Norfolk Mardler is a pasteurised, hard, goat’s milk cheese made by Sam Steggles of Fielding Cottage in Honingham, near Norwich. Fielding Cottage (which is the name of the former family home) are the only goat’s cheese producers in the county and have been making cheese since 2009, a year after buying ten milking goats whilst on a family holiday in Cumbria. They now have a flock of some 800 mainly Saanen, Alpine and Toggenburg goats and rear them for meat and milk (which goes to make both cheese and a skincare range). ‘To mardle’ is fortunately no relation to my Staffordshire ‘mardarse’ and instead means ‘that slow country conversation somewhere between rumination and gossip’ in Norfolk dialect. Norfolk is not a county renowned for cheese-making historically and indeed one of the few references I can find declares that its dairymaids were renowned for being ‘extremely culpable’ at making ‘rancid’ cheese that they allowed to turn into ‘literally so many bags of maggots.’ Fortunately, latter-day producers such as Mrs Temple’s cheeses, Ferndale Farm and Fielding Cottage are restoring the cheesy reputation of the county. Mardler is matured for eight weeks and is a beautifully white cheese, so much so that my camera refused to find anything on it to focus on and took some convincing to take a snap. The waxed rind is a beautiful sunshine yellow, leading me to believe that East Anglia make the prettiest cheeses in the land. Don’t believe me? Then check out Suffolk Gold, which is a Swedish supermodel of a cheese. But back to Mardler…it has a firm texture, slightly open and really creamy to taste. There’s a hint of pleasant goatiness in there but overall it’s rich and a great balance between sweet and savoury. This is definitely a cheese worth mithering with. Additional research from Dereham Times and The Telegraph. Oh, how lucky. We’re going to Norfolk next week. I’ll get right mardy if we can’t find any mardler to taste. I hope Norfolk Mardler is available beyond the county line… it sounds too good to miss out on. Not sure – I’ve only ever found it in East Anglia, but I guess it finds its way outside at times!